Do you like pogo sticks? For Pogophonic artist Gil Kuno rigged Vurtego high-performance pogo sticks for sound. The men in the picture below are composing. Click image to view the video of the composers in action on Kuno's unsound.com. 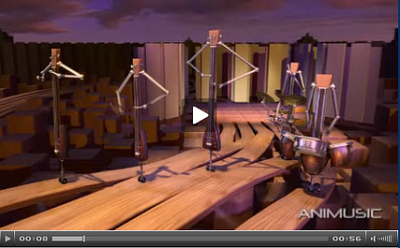 The pogo sticks in the Animusic of Wayne Lytle and Dave Crognale aren't real. Lytle and Crognale synthesize both graphics and music using proprietary software. Click to view animation on the animusic site.